If you’ve been reading about Virginia’s solar growth, you know that regional utilities are investing in solar in a big way — with companies like Dominion Energy purchasing large solar installations in multiple counties. You know that schools like UVA have dedicated portions of their budgets to green energy. But sometimes it seems like the solar boom is happening so fast, it’s like it’s happening everywhere at once. For example, those familiar with large solar farms run by Amazon, such as an 80-megawatt installation in Accomack County, might be surprised to know that some other solar plants are slated to be even larger than the Amazon U.S. East solar installation. Just a few weeks ago, breaking reports in local newspapers showed plans of a new project called Farin & Pearfield Solar in Gloucester County. Pictures of the project show some 375,000 panels, ground mounted with swiveling hardware allowing them to catch the sun’s rays at particular angles. Charlottesville Daily Press coverage shows the CEO of Hexagon Energy, the company behind the project, talking about how there’s a lot of potential in Gloucester County, which is relatively less developed than some other parts of Virginia. “Gloucester is an area of the state where there is open, undeveloped land and land not adjacent to large metropolitan areas. These projects can be harmonious with other agriculture and timber uses in the county,” Hexagon CEO Matt Hantzmon said. It means that more businesses and consumers will have access to renewable energy supplies. It means that more of Virginia’s electrical grid power is going to come from the sun. Solar is truly taking over at an amazing pace. At the same time, small businesses and individual property owners are looking to also benefit from solar installations. With net metering agreements, it’s possible to harvest the sun’s energy and collect energy credits from your utility provider. 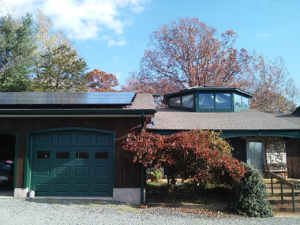 Anyone with questions about these smaller types of projects can get effective assistance from Sun Day Solar, a major solar service company in the Charlottesville, Virginia area. Ask us about what’s happening in your community and how you can get on board. Let us help you evaluate your plot of land and what’s possible in order to make your operations greener and lower your carbon footprint for a brighter future.